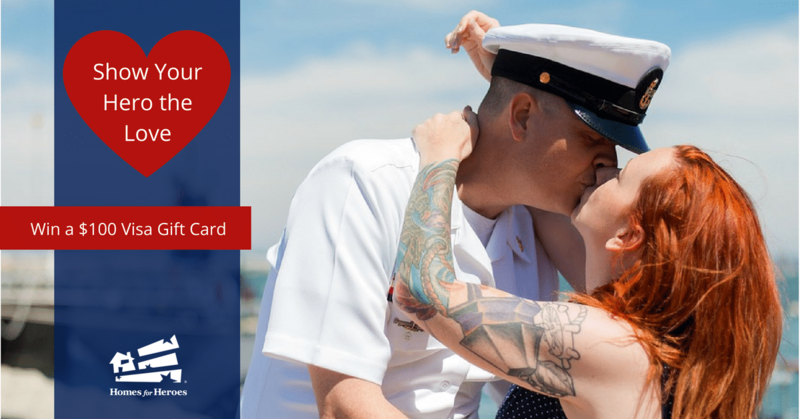 In the spirit of Valentine’s Day, Homes for Heroes is running a contest to show your hero the love! We want you to participate and show your hero the love! Submit a photo with a special love note to your hero, and Homes for Heroes will share it on our social media pages. At least one hero in photo. At least one hero must be in uniform (if applicable). Must include a note to accompany the photo. Please keep it family friendly, nothing graphic or insulting. Willing to share on social media. We will combine your photo and note, and we will share it with our followers between the dates of February 13th and February 17th. If you provide the first name(s) of the people featured in the photo, we will include that in the posting. By submitting your photo and note, you acknowledge that you and all parties portrayed in the submitted photo, confirm Homes for Heroes may share the photo and note in social media applications. Homes for Heroes will post your photo on our Facebook page between the dates of February 13th through 17th. The photo that receives the most “Likes” by February 20th from our Facebook followers will win the $100 Gift Card! Homes for Heroes will follow up with the winner to confirm a mailing address.